Our egg-wagon is up and rolling. After two years of planning, preparation, and construction we finally put our egg layers out to pasture. 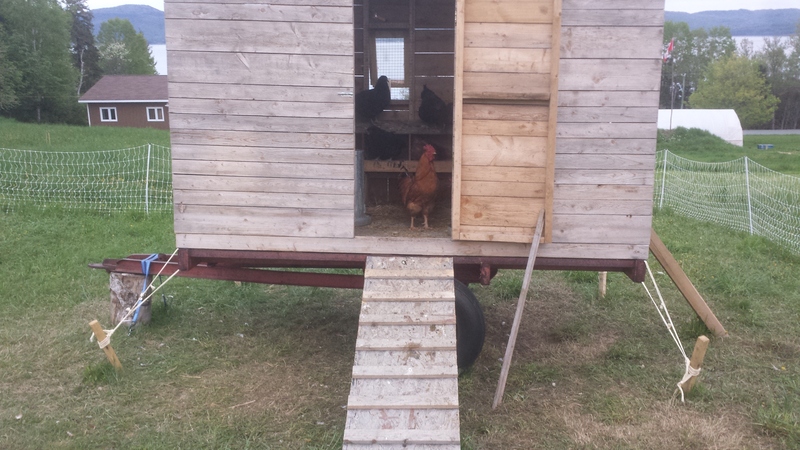 With built in nesting boxes and roosting space, the 7′ x 12′ egg-wagon is built to house up to 60 birds. Given that this is our test phase, the birds currently have around 1700 square feet of salad bar to feed on, exercise in, and express their species specific behaviors. 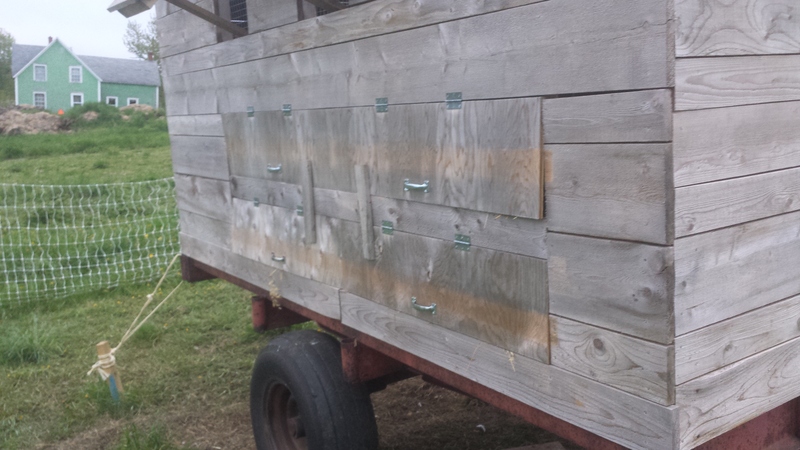 At present, we are moving the egg-wagon to a new section of greenery every 7 to 10 days when the grass is eaten down and fertilized by chicken manure. We’ve had success with fertilization by chickens using our chicken tractors so I am curious to see the rate of grass growth after one pass on a chicken grazing quadrant. Our set up includes our egg wagon, waterers, feeders, free choice grit, calcium, and kelp meal, electric poultry netting, and an s17 Gallagher solar energizer. The s17 is not recommended, however, if one mows the perimeter of the fencing before installation, there is lower impedance that allows for a fully functional and electrified poultry netting. In one week, one bird jumped the fence and made her way back to the chicken barn. To date, it’s been successful, but we’ve found that egg production dropped markedly over the first 3 – 4 days while they acclimated to their new surroundings. White egg layers, who have a tendency to lay in the grass, stain their eggs making an egg unappealing to customers. 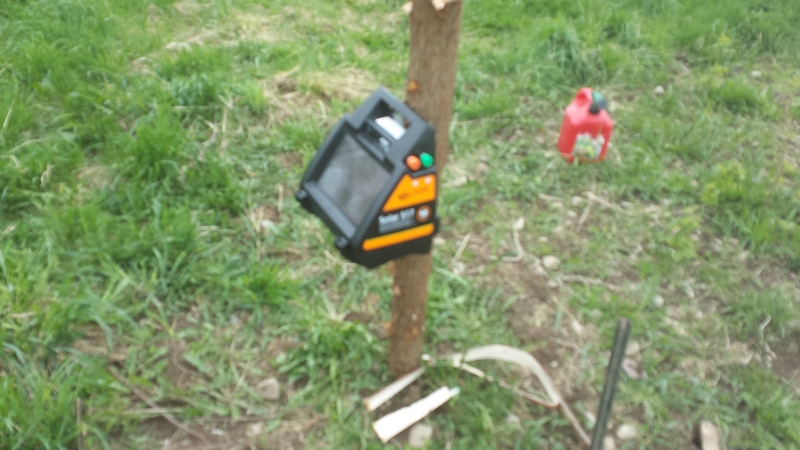 I am thinking of adding cut out milk crates for portable nesting boxes as well. A brief search on http://www.backyardchickens.com should produce some creative ideas for extra nesting space. In for the night, I just might. I can truly share with you that it is very rewarding, aesthetically pleasing, and peaceful to sit and watch the birds run around their mobile enclosure, safe from predation and free to be chickens. I can’t imagine a bird of such activity being stuck in a cage to lay eggs for the duration of their lives. Can you? Given that the egg wagon is built on a single axle frame, we stake all four corners and strap down the hitch with dog t-screws. During the second move, one side of the fence remains in place, while the other lengths are moved to a freshly cut strip and staked to establish the next grazing quadrant. This can be done with one person, but two is preferred. 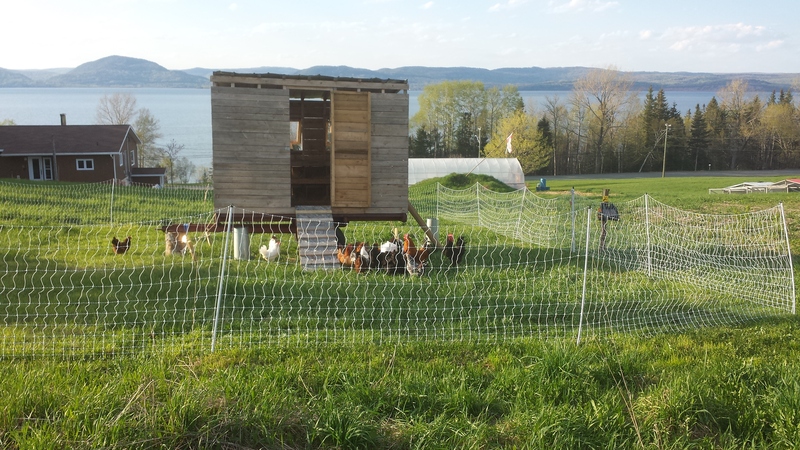 Keeping chickens in a restricted free range egg laying system requires letting them out of the coop every morning. Filling waterers as necessary and feeding birds their daily layer mash ration. It is important to keep a pan of grit, calcium, and seaweed available as well. Supplementing these things may help to deter heavy scratching on the grass bed. Nothing is more tedious than willing chicken ruts in your fields. Every week I clean out the nesting boxes, putting down new straw. I also shovel out poop inside the egg-wagon onto the grass between moves. Roosting space is incredibly important as well to maximize space inside the coop for night time roosting and also provide a place for hens to get away from the roosters and other bossy hens. Remember to provide ample width for the birds to place their feet on the roost. A two by four is suggested and it’s what we use for all roosts. Restricted free range eggs have arrived on MacCurdy Farm.